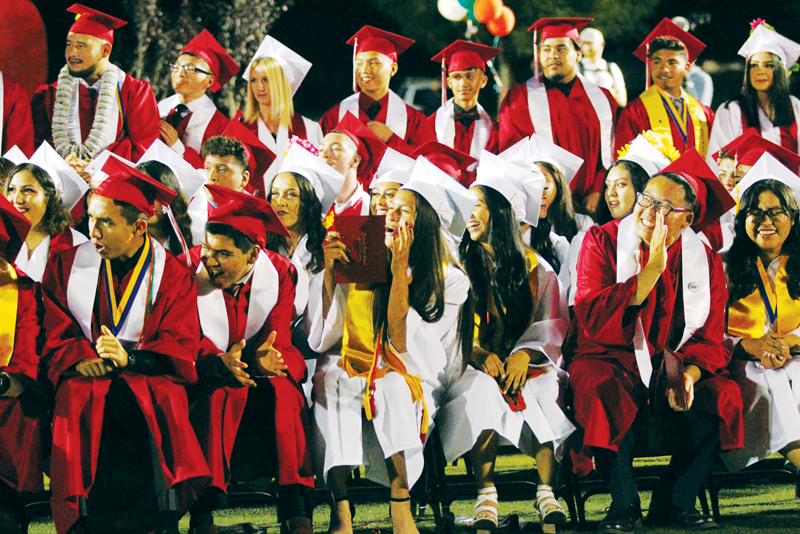 LINDSAY – One of the largest classes to graduate from Lindsay High School donned their red and white gowns last Friday night. In all 231 learners received their diplomas. Among them were the last learners to be born in the nineties, and a variety of speakers all from different ethnic backgrounds showed the diversity of the school. But Lisbeth Ceballos-Lemus stole the show when she signed her welcome speech. The speech was also read by learning facilitator David Mashtal. Ethan Duran shakes the hand of principal Heather Rocha after receiving his diploma. Photo by Patrick Dillon. When Principal Heather Rocha offered to have as many learners participate in the ceremony as possible Lemus decided to give signing a speech a try. A decision Lemus might not have came to had it not been for the creation of an American Sign League class (ASL). “I felt like I was invisible to people,” Lemus signed. Growing up it was difficult for Lemus to make friends because of the communication barrier. She wanted to teach her elementary classmates how to sign, but was too shy. At first the feeling carried over to the campus of Lindsay High School. There many of the learning facilitators began to notice her, and for the first time she felt seen. Then her classmates began to take notice, and learn how to better communicate with her. Even to the point every learner raised up their hands, and waved them back-and-forth, applause in sign. “Today marks the end of my four high school years, and I’ve grown so much,” Lemus signed. Lemus had not only taken every ASL class at Lindsay but been a figure in making the class a fixture on campus. She even graduated with college credits in ASL. “Encourage your shy friends to be brave, and to all my fellow seniors, continue to grow in bravery out in the real world,” Lemus said. Further on in the ceremony this year’s co-valedictorian Ikonkar Khalsa referred to her class as a seed turned into an orange tree over their four years. With a clean slate they walked onto campus curious, confused, and excited. Then over the years Khalsa and the rest of the learners finally saw some growth. It finally came after a hectic junior year filled with a difficult schedule which included advance placement (AP) history. Yet, despite the difficulties Khalsa reminded her fellow graduates they were the class which never quit. She reminded them to keep on striving no matter what the next chapter in their lives held. The only acceptable time to stop was to help someone else. The class of 2018 from Lindsay High School achieved both in and outside the classroom. A total of 15 learners tied for the top 10 highest grade point averages in the class with Khalsa and Oscar Ambriz both being named valedictorian. On the playing fields the Cardinals’ soccer team won valley a year ago and extended their East Sequoia League title winning streak to six. Baseball won their first valley title in 26 years. The engineering academy earned top honors for their internet project. In the middle of the ceremony Principal Rocha took the stand. She reminisced on the three years she had spent with the class of 2018. However, before leaving she left her learners with some parting advice.